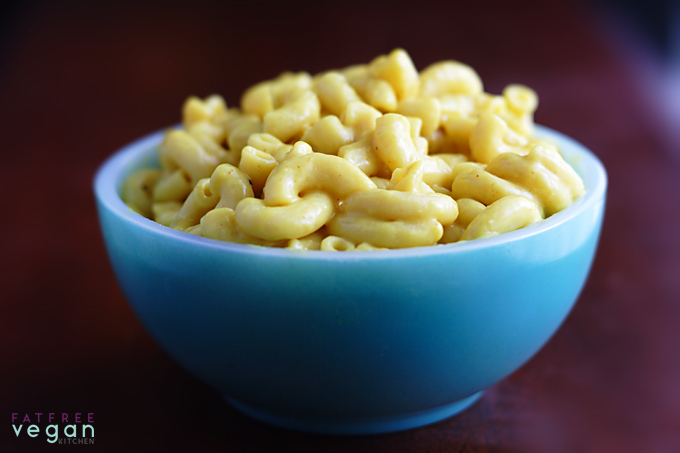 Get ready for a creamy vegan macaroni and cheese that is low in fat and quick and easy to make! It’s a funny thing, but the recipe I’m asked for most often is the one I’m most reluctant to give out. 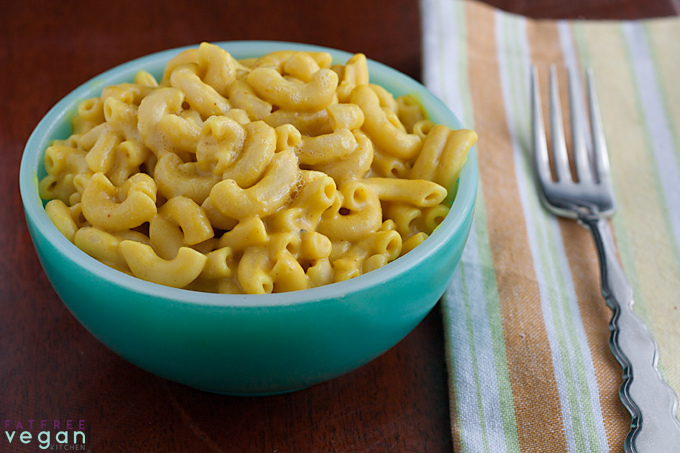 Every time I mention that macaroni and “cheese” is one of E’s favorite dishes, parents wanting to wean their kids off the dairy stuff and onto something more healthy ask me for the recipe. For a long time, I had to tell them the hard, cold truth: The “cheese” that E loved above all others came from a package, and though I tried recipe after recipe, she wouldn’t eat any other mac and cheeze. And then one day I decided I’d had enough. I was having to mail-order Road’s End Cheddar Style Chreese in bulk once every couple of months to keep E supplied with her quickest comfort food. (Her other favorite comfort food, lasagna, doesn’t fit into the make-it-on-the-fly category.) Each time I made it, I would look at the short list of ingredients and think that there had to be a way to recreate it at home and I just hadn’t hit the right formula yet. So in the interest of eating more local and fewer packaged foods, I started experimenting. I took the sauce from the one cheezy recipe that she had liked, Scalloped Potatoes, and tried that on macaroni. No dice. What worked on potatoes didn’t work for her on pasta. So I tinkered with it and then tinkered some more. Finally, sometime last spring I hit on a formula that worked, and we’ve been Chreese-free ever since. But I was still reluctant to share the recipe because vegans are notoriously picky about their mac and cheese. Look at any vegan bulletin board and you’ll see someone praising a m&c recipe and someone else declaring that the same recipe tastes like $#!+. What works for my family won’t necessarily work for everyone else, and I would hate for anyone to spend the time to make this recipe and then be disappointed. Plus I’m just sensitive enough not to want to read online that my recipe tastes like someone’s backside. But enough people want this recipe that I’m issuing it with a disclaimer: If you are used to nutritional yeast sauces AND you like Road’s End Chreese, then this might be the recipe for you. Notice that it’s not baked in a casserole dish with bread crumbs or anything fancy (E hates that, unfortunately). It’s macaroni and sauce, period, though sometimes we do add frozen green peas to make it Macaroni and Peas. But it’s quick to throw together on a week night, and I have to admit that our whole family finds it addictive. Besides being low-fat, this recipe is also low in sodium, so salt-lovers may need to add salt. The tahini adds a little fat but a lot of flavor; still, leave it out if you need a completely oil-free dish. Put the pasta on to boil, according to package directions. While it’s cooking, blend water and all remaining ingredients together in a blender. When the pasta is al dente, drain it, reserving about 1/2 cup of the cooking water, and return the pasta to pan. Add the sauce mixture and cook, stirring, until mixture boils and thickens. Add a little of the pasta water if more moistness is needed. If the sauce is not as flavorful as you’d like, add a little more mustard and onion powder. If you use nutritional yeast fortified with B-12, one serving provides 100% of the daily requirement of that vitamin. For a soy-free version, use any other plant milk and substitute salt for the miso. Serving Suggestions: We like to have this with a bean dish, such as barbecued beans, and with steamed vegetables, most often a blend of broccoli and cauliflower. Additional Uses: Heat the sauce alone until it thickens and use it to pour over baked potatoes or top pizzas. Or stir in some salsa and it makes a yummy dip for tortilla chips. If you don’t love this recipe, maybe one of these will tingle your tastebuds:New Farm Mac and Cheese adapted by Jess of Get Sconed! Thanks for the recipe, Susan! SO EASY & so creamy! I just tried this recipe, and it is definitely a keeper! So creamy and tangy and wonderful! 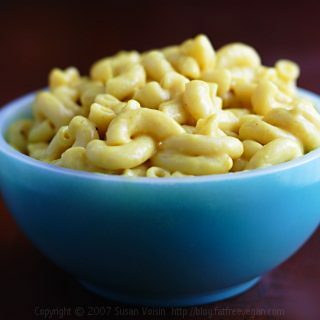 I’ve tried a lot of vegan mac and cheeze recipes over the years, and this is one of the best I’ve had. Plus, it is SO EASY that even a slowpoke in the kitchen like me can have the sauce ready by the time the pasta is done cooking! I love that you don’t have to wait for it to bake; you just heat the sauce for a couple of minutes and it’s ready to eat. I’m sure if you wanted a crunchy, breadcrumb top you could bake it, too. I did add a lot of extra nutritional yeast because I LOVE nutritional yeast, but I tasted the sauce first, and the recipe has tons of flavor as it is written! This is my first recipe I’ve made off of this site, and I definitely intend to try more! Thank you for posting this! I didn’t have a 1/2 teaspoon measuring spoon so might be he reason… but mine had a mustardy tangy flavor. It was soooo delicious served over baked onion, broccoli, potatoe mix. My husband and I absolutely loved it. I love your above idea about adding salsa for a chip dip. This was amazing! I was skeptical even after reading everyone’s reviews of it as I have tried many vegan cheese recipes that were kind of gross. My 3 boys even enjoyed multiple serving of this. Thank you so much for a healthier alternative to regular mac n cheese! I have to tell you I have made this recipe countless times and it is amazing. I’m am a vegetarian, but I also don’t eat cheese because (to put it politely) it messes with my digestive system so I was looking for something to fill my mac and cheese craving. This didn’t do it at first, but it had it’s own amazing flavor. Now that I’m not eating cheese anymore I crave other things including this recipe! I love it! It’s a new staple recipe in my family! Thank you! I miss cheese and want to try this so bad today! Can something else be subbed for miso, or can it just be left out without effecting the “cheezy” goodness? Stephanie, you can just add extra salt to taste instead of the miso. It won’t affect it a huge amount. I hope you enjoy it! Had some left over soya minced all cooked up and spiced, but didn’t know what to do with it… So I checked on this site for something quick easy and yummy to make – so glad I came across it! I just chucked it all together! I tried making the portion smaller (just kind of half everything until it seems right) and came out DELICIOUS!! Thanks! Question though, you have any ideas how to make it more sticky/stringy like real cheese will make it? It just occured to me… what if you add some guar gum or xanthan gum for the stringy melty cheese effect… would that work? You could give it a try. My fear is that would make it congealed rather than stringy, but you never know until you try! Thank you so much for posting this! I follow Dr. Esselstyn’s heart attack proof diet, eliminating meat, dairy, fat, and oil. I’ve tried the name brand Chreese, and was sadly unimpressed. I tried this recipe, minus the tahini (fat content), and it was so good I did a little happy dance. I’m planning on trying to use it for other things, like cheezy rice wraps with peppers and onions. Thanks again for putting this out there. I’ll be making it regularly. Susan – I made this last night and it is AMAZING!!!!!! Even my picky, picky, skeptical husband kept asking me for more. WOW!! You get an A+. Your recipes are FABULOUS! Question about the nutritional yeast. Does it make a difference if it’s the powdered kind or the flaked kind? I usually have the powdered kind, but your photo in your nutritional yeast post looks like flaked. Thanks for your reply! You only need half as much if you use the powdered kind. Made this tonight, even the pickiest eater cleaned her plate 🙂 Winner! OMG, I’m hooked on this, and I was a total mac and cheese snob, no kidding. It is better with just a little Natural Ballance. I used twice the amount of each spice in the recipe. One nice thing is if you bake it in the oven it gets all neat and crispy on the top. I had it with whole wheat pasta. I don’t recommend trying it unless you have been off cheese products for at least a month. The flavors are actually more complex than with usual mac and cheese. I dump hot sauce on almost everything I eat but you can eat this without it. Kinda wondering if adding a little tomato powder would be good. I have been off dairy for a little more than a month, and when I fist tried this I was a bit “meh” but a few hours later I started craving it. Really grows on you, or at least it did for me. Thanks for the recipe! THIS STUFF ROCKS! It is so delicious. I’d say it’s almost too delicious! I have absolutely no self control with a big old bowl of this–good thing it is so low in fat! Thanks again for your great work. This was the first time I tried cooking with nutritional yeast and this Mac n cheese dish turned out wonderfully! My 6 and 9 yr old gobbled it up. Followed the recipe to the T and was great. Next time I might add sautéed onion and garlic for more punch, but the written recipe was superb. I have made Mac n cheese using the Daiya cheddar cheese and it tasted terrible and fake, but using the yeast tasted soooo good. Thank you for posting this!! We went plant based almost three months ago, and this is the one menu item my kids constantly ask for. I made this recipe this evening and added some broccoli and everyone loved it! Thank you! I added a bit more mustard powder and then simmered it for about half an hour with some fresh garlic (2 cloves), 1 Tb of olive oil, and about 1/2 cup of vermouth. It was spectacular – creamy, rich, delicious, and the closest thing to fondue cheese I’ve found. wow this recipe sounds very promising, along with the comments! How important would you say is it to use powdered instead of fresh mustard, onion and garlic? I use fresh stuff all the time so I’d rather not buy the dried versions unless it makes a real difference, maybe the fresh versions will add too much water? Also, is it a must to use a blender or would it be ok to just mix it all manually? Hi Silke in Germany! I think fresh garlic and jarred mustard could easily be used instead of dried. Onion is a little trickier to substitute because it’ll take more to get the flavor of the dried version. I think a blender will be more important if you use chopped garlic and onion, but if you mince them very small, you could whisk it together with some work. Good luck! I tried your easy macaroni and cheeze recipe last night and I just had to tell you how well it turned out and how delicious it was. I used a whole grain rotini instead of elbow macaroni and did not use miso. I also added mixed frozen veg to the pot. Just writing about it makes me want to go get it out of the fridge and have it for breakfast. Thank you so much for this recipe! I love this recipe! My 9 and 6 yr old gobbles it up. I’ve made it so many times since finding it here. It simple and doesn’t take up a lot of pots and extra steps. I’ve since thrown in a small chunk of raw onion into the blender and 1-2 cloves or fresh garlic. The fresh flavors add so much taste, but in a pinch, powdered onion/garlic works just fine. I’ve also added about 1/2 cup of Daiya dairy free cheddar cheese for more richness and flavor, sometimes a little more depending on how thick I want the sauce. Thank you Susan for the great recipe! 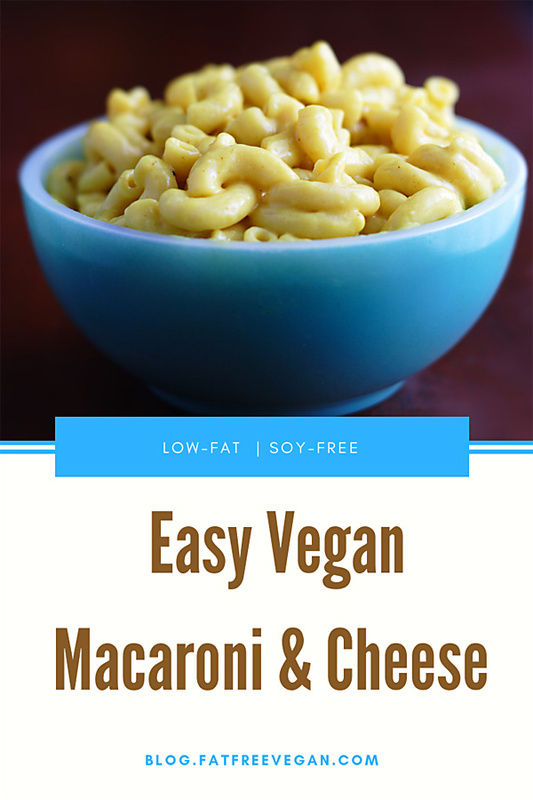 I tried making this for lunch today…I really enjoyed it but my 3 year-old rejected it:( We are still fairly new to being on a plant-based diet so her real mac’n’cheese memories (with butter and cheddar) are a bit too fresh, I think. I poured a jar of tomato sauce over it and made kind of a rosee sauce, which she liked until it cooled off, then she rejected it again…oh, well…you can’t win them all! For dessert we had a modified version of your banana-maple oatmeal cookies with cocoa and chocolate chips…and that was a hit! Yum…love the recipes! Keep them coming! I made this tonight; it’s so easy but really tasty! Thanks for sharing this recipe. Thanks for sharing! Now all I have got to do is hunt for nutritional yeast the next time I really do have time for grocery shopping… I am trying to reduce our consumption of animal products as far as possible (the BF will never be a vegetarian, and I am not sure about myself), and this sounds like a great recipe for trying alternatives. After reading all the comments I was totally stoked for this and then… I didn’t love it. But I don’t think the problem was the recipe. I think I’m just realizing that maybe I don’t love the taste of nutritional yeast. I think next time I will half the yeast and add in some vegan cheese. I just made this tonight and I think it turned out really well. I love how it doesn’t have any “fake” cheeses that you can buy at the store, as they really are not that healthy for you. I didn’t have the tahini, or the miso. And I did not add the cayenne pepper. I think it has plently of flavor and spice. I hope my kids will enjoy this. I have been dairy free for almost three months, so this is great. Loved the mac and cheese recipe. I recently decided to follow a vegan diet and, as a result, am trying to find tasty vegan recipes. This recipe was great. With a squirt of ketchup on top, it is reminiscent of a childhood favourite and the dairy is certainly not missed. Thank you! I’m not sure why I never commented on this recipe, because I’ve been making it for years now. I never actually liked dairy mac and cheese (lactose intolerant) but I CRAVE this stuff. Even my dairy loving omni boyfriend thinks this stuff is delicious. He doesn’t like calling it mac and cheese, because, really, it’s not, so we’re trying to come up with a more appetizing name than “Mac and Yeast” which is what we call it right now. I will totally admit to using powdered soy milk and premixing the dry ingredients in bags so it’s an even faster dinner. (Being Japanese, miso is a staple in my fridge. I usually try to keep tahini mostly for this recipe.) Premixing the dry ingredients makes this about as fast as making it out of a box, which is awesome. I didn’t think it could happen, but Susan, you make me crave vegan mac and cheese. this looks so good to me. I am going to try it and I am wondering if you have ever used this sauce recipe for anything else? I used to love cheesy scalloped potatoes, I wondered if you think it would work for that? Would I need to make the sauce on the stove top and then add it to the potato’s and then bake? Thank you! Oh yes, you can use the sauce for anything you would use a cheese sauce. I heat it on the stove until it’s thick and use it on everything from baked potatoes to nachos. You can mix it with salsa for a great dip. For scalloped potatoes, you’ve got the right idea. I have a recipe for them that has a different sauce but you can use this one instead. It’s at https://blog.fatfreevegan.com/2006/03/creamy-scalloped-potatoes.html. I’m a new vegan (Day 36) and so far everything I’ve made from your website has been delicious!! Swiss chard & white beans, No Fu Love loaf & now this Macaroni &cheese. The best part of all is that my kids are loving it too! This was super fast and easy to prepare after work for dinner tonight. Threw in some peas & dinner was done! Thank you thank you! O, my, word!!! Thank you from the bottom of my heart. I am recovering from surgery and have craved mac and cheese and unfortunately have ate it and not felt well. I have looked at this recipe and even pinned it, but I was scared of it. It was GREAT!!! It has to be lower cal than many of the other recipes I seen. Some of them called for a whole cup of oil. I work for WW and I think I will share this!! I only had reg paprika, I used almond butter for the tahini, I used reg mustard, and I had no cayenne. I was SO scared. I thought it was a waste of time AND food. I thought it smelt bad. I thought it tasted GREAT! We have a Heavenly Oil store here and I added just a tiny bit of butter flavored oil to my portion=perfect!!!! Thank you and God bless you!!! Signed, trying and leaning toward being a Vegan,lol. Anyone tried this with zucchini or cucumber noodles instead of pasta? I am confused. Add the sauce mixture to the drained cooked pasta and bring to a boil? Or, add the pasta water to the sauce mixture and bring that to a boil? Then add the sauce mixture to the pasta? Add the sauce mixture to the drained pasta and bring to a boil. It will thicken as it cooks. If it gets too thick, you can add some of the 1/2 cup of pasta water to thin it out. I am always willing to try a new Mac and Sleeze recipe. My youngest will still not touch a sauce with too much NY….maybe this one will work….thank you! I have a soy allergy so need to replace the soy milk. Any suggestions as to which vegan milk would work best? Any non-dairy milk will work, so pick the one you like best. Last night I made it with coconut milk, and nobody noticed the difference. I have been so excited since I found this recipe. I’m not able to eat processed grains and I miss Mac and Cheese so much! I tried the roadside yesterday, it was good. I made this recipe today and it was great. I have a lot leftover sauce which is in the fridge. Imputed some in with quinoa and heated on the stove. Delicious!!!! Such a nice healthy treat!!! Thank you for all your recipe work. Your making my healing diet so much more bearable. I made this tonight and we enjoyed it! Thanks! I loved this recipe! However, I wondered if you might have a substitute for the corn starch that is a little more tummy friendly 🙂 Would arrowroot or agar flakes work just as well? I love your blog! Arrowroot or potato starch would both work. Hope they make it more “tummy friendly” for you! Made this last night and really enjoyed it with my husband. I always look for ways to add an entire bag of greens to recipes and I was able to incorporate a pound of spinach with the pasta right after adding in the liquid from the blender. Just made this tonight, and one word: YUM! I did not have the onion powder or garlic powder, so I used 1/2 an onion and 6 cloves of garlic (we really like onion & garlic!) and it was FABULOUS!!! Also boiled some brussels sprouts with the pasta, and then finally topped with vegan bacon bits. I will definitely make this again…it was a breeze in the Vitamix. Thank you! This was awesome! I didn’t have any tahini, so I used a coffee grinder and ground sesame seeds (I do the same thing for my hummus). No miso, so a little extra kosher salt. It was really tasty! Even my boys are eating it up. I am in the early stages of making healthy eating changes. My boys (12 & 18) have not exactly embraced this yet, so I am careful about how I word things. I would never hand this to a die-hard mac & cheese lover and say it was mac & cheese. I said it was pasta in a cream sauce – just a new recipe I was trying out. That way their taste buds don’t have a mac’n cheese expectation! They said it was “ok” but ate every bit of it. You. are. awesome. This has single-handedly made me never need my FAVORITE food, mac and cheese, again. Thank you so much for taking the time to figure this recipe out and for being talented enough to sort through the flavors. I heart you! excellent mac & cheese, loved it! thanks! !